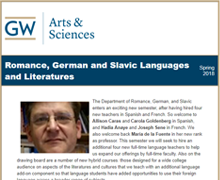 Gifts to the Department of Romance German and Slavic Languages and Literatures enable us to provide support for faculty and student research and travel, graduate student fellowships, and academic enrichment activities including guest speakers, visiting faculty, and symposia. Each gift, no matter how large or small, makes a positive impact on our educational mission and furthers our standing as one of the nation's preeminent liberal arts colleges at one of the world's preeminent universities. Give online and make a difference today.